On March 28, economist, Stanford professor, and long-term Microsoft consultant Susan Athey gave a lecture entitled “Impact of the Internet on the News Media.” In this lecture, Athey explained how in recent years there has been a loss of “good journalism” as blogs and aggregator sites like Google News have begun to grow. Readers are getting their information from many different sources, and only a few of them are “real” newspapers. Athey went on to explain how the Internet makes it easy for consumers to switch between several different news outlets and how this affects newspapers. She also discussed how news media interacts with the rise of social media and aggregator news sites. Athey explained that when everyone is able to access news through many different sources, much of the advertisement revenue that is generated by newspapers decreases. While the Internet makes it easier for consumer switching to occur, it also makes it harder to track what consumers are reading and where they are reading it. This makes it harder for news sites such as The New York Times to track what their consumers are reading and what kind of advertisements they should allow on their sites. “Newspapers used to have a monopoly on their audiences, and if advertisers wanted to reach readers of certain newspapers, they would have to reach out to that newspaper specifically to get their readers,” Athey explained. Now, however, with consumer switching, readers are not guaranteed to stay at one site and will most likely consume news from several different sites, making it difficult for advertisers to target specific audiences through a single newspaper. Now, advertisers must use multi homing (advertising through multiple news sources) to reach the same groups, meaning they must advertise via a variety of sites. This is not always precise, however, and can result in advertisers wasting the same advertisement on the same readers. On the other hand, if advertisers choose to use single homing, they are potentially missing out on consumers by only being present on one news source. Athey continued on to talk about how “the business of a newspaper is to match users to advertisers.” Essentially what this means is that it is the job of the newspaper to provide content that is enticing to the type of consumers that advertisers want to reach. Aggregator sites such as Huffington Post and Google News increase consumer switching, which makes the problems that advertisers face even more apparent. These sites aggregate news from different sites and provide it in one location that can be customized based on the preferences of the user. The presentation of these news stories makes a difference on what is read. Readers generally won’t go to the second page of a site for search results even if that’s where the best information is. They tend to select the first available option presented to them by aggregators. These aggregator sites generally use this idea to their advantage when laying out their sites and choosing resources. This can be a good and a bad thing for other news sites. While it can attract readers to a news site they might not have gone to before, it also sends readers to other sites and reduces the number of clicks on specific news sites. For example, Google News has a very strong impact on the traffic that other news sites receive, Athey explained. To conclude her lecture, Athey presented research that showed that people tend to read more biased news on social media as opposed to the news they would read from just direct navigation to a source. She explained that while social media is beneficial for “selling the ability to reach” to advertisers, consumers will only see what they want to see based on personal biases. This poses a new challenge for advertisers and traditional newspapers. Not only have users switched where they are getting their information, but they have also switched what information they are interested in reading. Despite the shift in the way users are getting news, Athey ended on a positive note. “We know people are reading,” she explained. “People haven’t stopped reading.” Athey’s research shows that users haven’t stopped looking for news and they haven’t stopped consuming it. 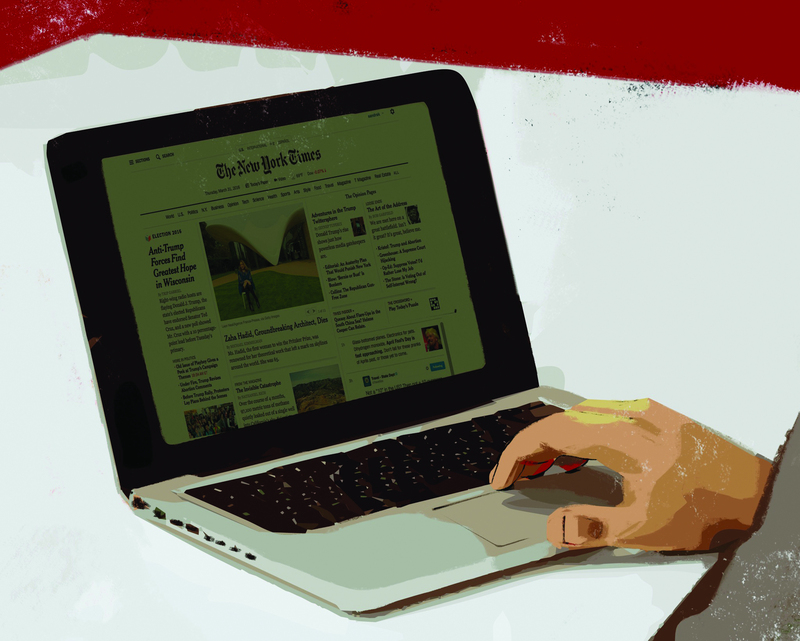 If advertisers and traditional news outlets can tap into the viewing patterns of their previous and existing consumers, there is still hope for “good journalism” after all.